If you can get past the quirky shape and some initial setup hassle, the Sony BDP-S590 is a terrific Blu-ray player and a solid value. Shopping for a Blu-ray player has changed considerably over the past couple of years. In the past, as you stepped up the model ladder, you gained features such as Internet apps, network media streaming and HD audio decoding. Now those features are available even in entry-level models, leaving the feature list separating the low end from the high end very lean indeed. But recently, 4K came along and changed things. 4K – which some call Ultra High Definition – promises resolution four times that of our 1080p televisions and, some believe, could end up being the next major evolution in home television. In fact, companies such as Sony are banking on it. Not only has Sony done all it can to pave 4K’s way into commercial movie theaters, but it’s also sneaking 4K into the home market by incorporating 4K up-scaling into its top-of-the-line Blu-ray players. Ironically, this feature provides no practical benefit for anyone now because the only commercially available 4K-capable display devices usually have the very same up-scaling feature built in. However, this ahead-of-its-time technology has provided companies with a new feature that justifies a certain price spread among player models. In short, 4K is your friend because it has helped drive down the price of fully featured Blu-ray players. Case in point: the Sony BDP-S590. What separates this model from the step-up BDP-S790 essentially boils down to 4K up-scaling…and $120. The BDP-S590 offers almost everything you could need from a Blu-ray player at a reasonable price. But how is the user experience? We aim to reveal that in the following review. The S590 is a light-weight player with a glossy black plastic case. It doesn’t sport the kind of build quality that instills pride and confidence in your purchase as you pull it from the box, but that doesn’t mean it won’t run like a champ for years to come. The disc tray itself, for instance, is more solid than most and an indication that the build quality underneath the case is likely better than the case itself. As we evaluated the top surface of the player, we became concerned about the finish’s durability. The faux brushed-aluminum look is nice, but the surface doesn’t feel resilient enough to resist scratching. We later learned that we were right to worry. Just placing remote controls on top of the player was enough to scratch it. And this thing loves fingerprints. Best to keep this unit tucked away and on the top of any component stack. In the box with the BDP-S590 we found a remote control, batteries for the remote and product information. The S590’s odd U-shape is not going to be everyone’s favorite. We appreciate Sony’s trying to ditch some right angles in an effort to smooth out the player’s appearance, but this is the kind of design that looks dated the day it comes out. Otherwise, the S590 has a clean facade. A thin chrome strip along the player’s top edge camouflages its four control buttons. The LCD display window is dark enough to be undetectable when the unit is powered down. 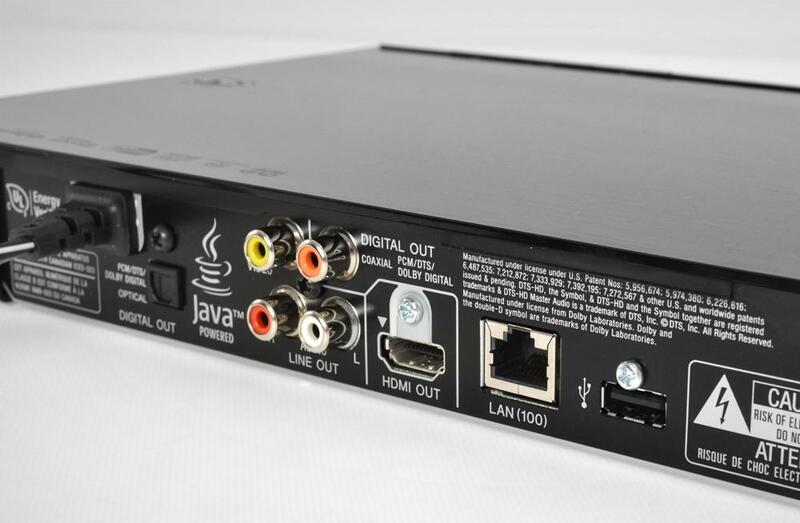 This player has a comprehensive list of connections, including both coaxial and optical digital audio connections, one HDMI output, a LAN port and legacy A/V connections. What’s more, the S590 has two USB ports (one on the rear and one hidden behind a plastic tab on the front), which allows fixed storage for the player’s use while leaving a readily accessible port on the front for media access on the fly. If no Ethernet connection is available (which we highly recommend for viewing streaming HD video), built-in Wi-Fi will get you access to all of the player’s Internet apps and any media stored on locally connected computers or network-attached storage devices. If you tire of using the provided remote control, Sony makes a remote app available for both iOS and Android devices. These are particularly convenient for entering usernames, e-mail addresses and passwords during the setup phase, thanks to QWERTY keyboard availability. The S590 is a 3D-capable player provided the rest of your video system is also 3D-ready. A 2D-to-3D conversion feature is built in, although we’ve never had much use for such a thing. We started out by connecting the BDP-S590 to our A/V receiver via HDMI and then plugging in a network cable and USB drive. Once powered on, the player’s default started us with a quick setup wizard. You can skip the wizard, but it does catch most of the essential settings. So we went through it. We linked the S590 to the media remote app on our iPad, thinking it would make entering usernames and passwords easier. This process was quick and straightforward, but getting into any of the Internet apps turned out to be a big hassle. Sony requires that you “activate” the device before it will allow access to any of the apps. This requires going to Sony’s website and creating a user account. We can’t think of any other Blu-ray players or televisions that require you to jump through as many hoops just to watch Netflix or Hulu. Once registration was completed, we dove into a few media apps, starting with Hulu. Hulu has designed its app so you don’t have to input user information into the player; you just activate the device from your Hulu account on a computer. Netflix, on the other hand, requires you to enter a username and password into the player – a perfect opportunity to use the media remote app’s keyboard (so we thought). No dice. The keyboard was unavailable for use with this app, and we ended up using the standard remote control to hunt and peck characters. Lame. We put away the iPad and just stuck with the standard remote. With access to all the major apps squared away (including Amazon Instant Video) we set about to evaluate the player. 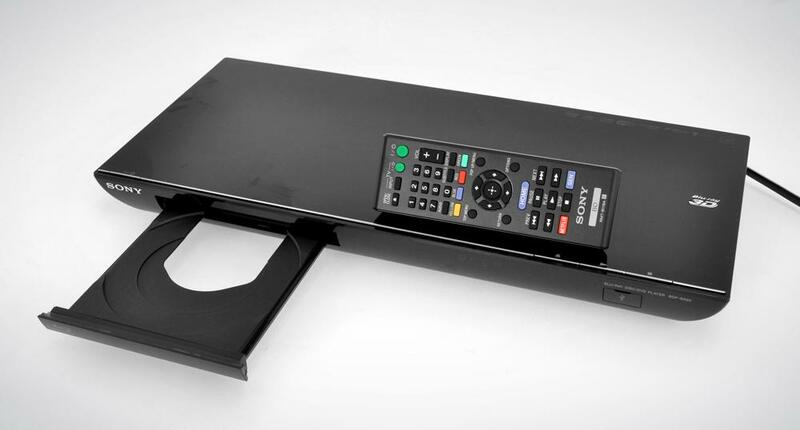 Blu-ray player performance comes down to a matter of user experience and reliability. Most Blu-ray players in the $80 to $200 price range deliver great video and audio. What separates the products are how easy they are to navigate, how quickly they react to commands, which apps are available and how easily content can be accessed. So we will focus our evaluation on these criteria. If you use the quick-launch option, this player boots up in just three or four seconds. Of course, the trade-off is that the player eats up more electricity when it is in standby mode. When quick launch isn’t engaged, the player takes closer to 25 seconds to boot which, by today’s standards, is a bit long. Disc loading time could stand to be faster – about 21 seconds on average from disc insertion to playback. But, if you combine the quick-launch boot time with the disc-loading time, you wind up with a total power-to-disc-watching time on par with most other players. We gauge a player’s navigation based both on how intuitive the menu is and how fast you can navigate the options. We’ve been frustrated with some of LG’s players, for example, for being lethargic at navigating a less-than-intuitive menu system. Although Sony’s menu is less graphic and flashy than some, it certainly is easy to navigate. Perhaps the ease comes because we use Sony’s interface frequently, but we had no problem finding where we needed to go and getting there fast. Even backing out of apps to the home screen is faster with this player than most others we’ve tested. And, unlike most players, you don’t have to venture into a separate menu to get at Internet apps. We couldn’t possibly go through all of the apps available on this player – Sony included far too many. We did test the usual suspects including Netflix, Hulu, VUDU, Amazon Instant Video and YouTube. The Netflix app was similar to those we’ve used on other devices, which is to say Netflix needs to give its app a facelift on all the devices it supports. Hulu Plus still leaves much to be desired, too. Vudu, as usual, was great, and the Amazon Instant Video app was easier to get around than the Roku version we often use. On the whole, the apps are typical. 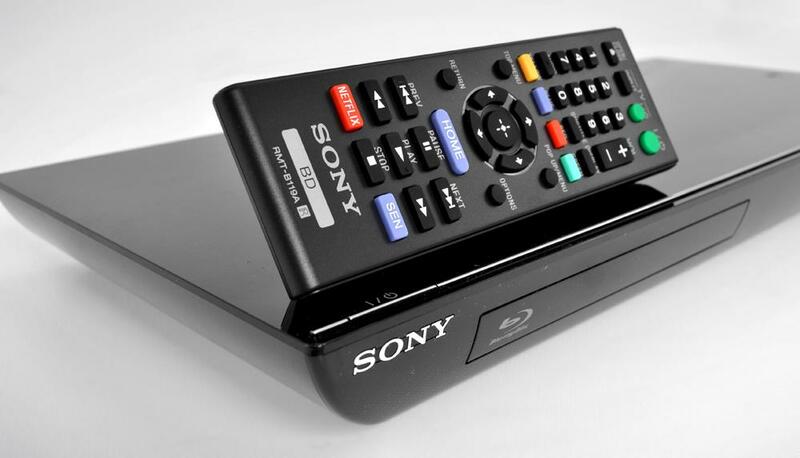 If you can get past the quirky shape and some initial setup hassle, the Sony BDP-S590 is a terrific Blu-ray player and a solid value – especially coming from Sony, which usually charges a premium for its products. Sure, we wish we could see better external build quality, but something tells us this player packs innards built well enough to stand the test of time. Blend that with quick response time, an easy-to-navigate menu and a generous number of apps, and you have a Blu-ray player well worth its average street price of $130.